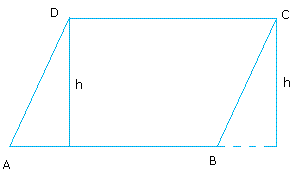 Start your proof of the area of a parallelogram by drawing a parallelogram ABCD. 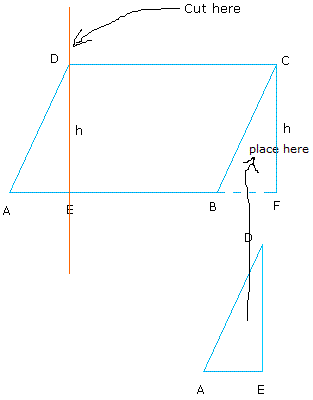 Therefore, if we can show that we can play with parallelogram ABCD to make rectangle EDCF, we are done. 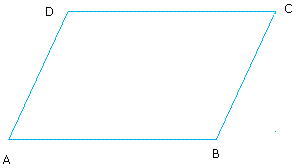 Carefully look at the figure again. 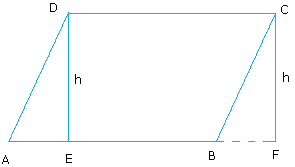 Do you think that triangle ADE is the same as triangle FCB? If this is really the case, you coud just cut triangle ADE and place it over triangle FCB until they coincide and here we go! All we have to do now is to show that triangle ADE is the same as triangle FCB and we are done!